ABNER or ABINER ("My Father is Ner"). According to I Chron. viii. 29-33, and Josephus ("Ant." vi. 6, § 3), an uncle of Saul; while I Sam. xiv. 51 and Josephus ("Ant." vi. 6, § 6) seem to show that he was Saul's cousin. The latter view is regarded as the more probable, although it involves a slight emendation of the Masoretic text in I Sam. xiv. 51 (read "sons" of Abiel instead of "son"). Abner was Saul's captain of the host (I Sam. xiv. 50, xvii. 55). After the fatal battle at Mt. Gilboa, Abner kept all the tribes except Judah faithful to Ishbosheth, then in refuge at Mahanaim. The disastrous battle at the pool of Gibeon (II Sam. ii. 8-30) sealed the fate of Saul's kingdom. Abner, smarting under a malign charge of Ishbosheth (II Sam. iii. 7-11), privately turned over his allegiance and influence with the tribes to David (II Sam. iii. 12-21). Joab, David's captain of the host, through jealousy and out of vengeance for Asahel's death (II Sam. ii. 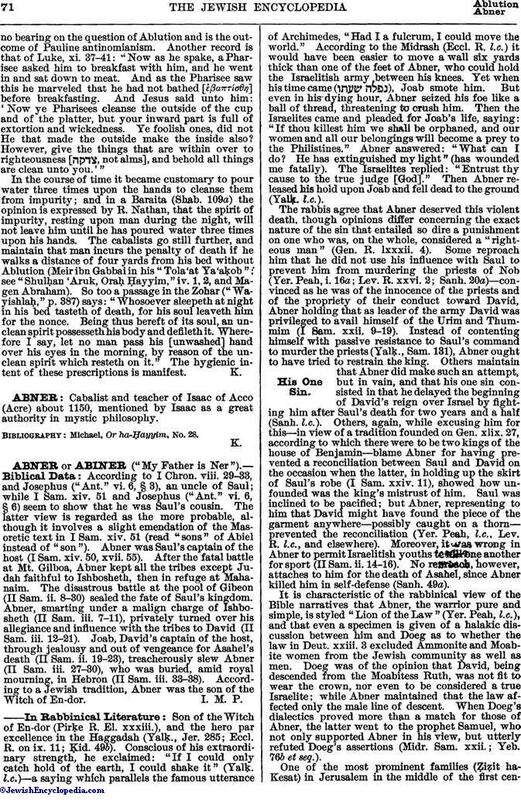 19-23), treacherously slew Abner (II Sam. iii. 27-30), who was buried, amid royal mourning, in Hebron (II Sam. iii. 33-38). According to a Jewish tradition, Abner was the son of the Witch of En-dor. Son of the Witch of En-dor (Pirḳe R. El. xxxiii. 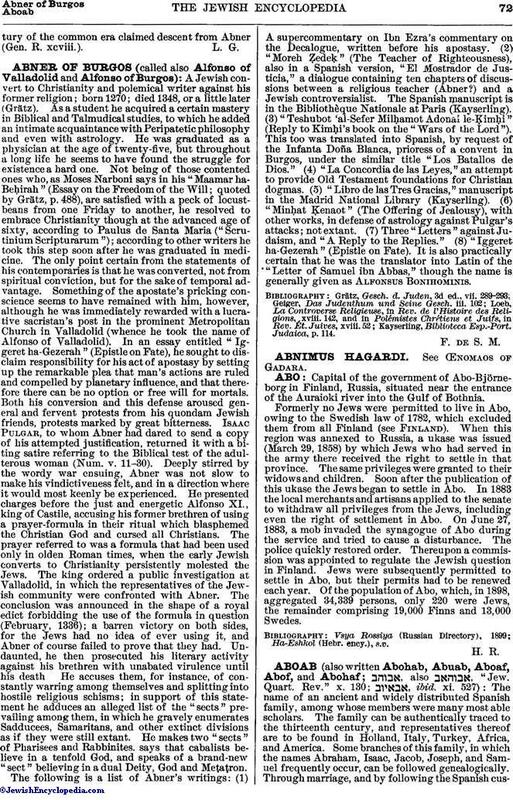 ), and the hero par excellence in the Haggadah (Yalḳ., Jer. 285; Eccl. R. on ix. 11; Ḳid. 49b). Conscious of his extraordinary strength, he exclaimed: "If I could only catch hold of the earth, I could shake it" (Yalḳ. l.c. )—a saying which parallels the famous utterance of Archimedes, "Had I a fulcrum, I could move the world." According to the Midrash (Eccl. R. l.c.) it would have been easier to move a wall six yards thick than one of the feet of Abner, who could hold the Israelitish army between his knees. Yet when his time came ( ), Joab smote him. But even in his dying hour, Abner seized his foe like a ball of thread, threatening to crush him. Then the Israelites came and pleaded for Joab's life, saying: "If thou killest him we shall be orphaned, and our women and all our belongings will become a prey to the Philistines." Abner answered: "What can I do? He has extinguished my light" (has wounded me fatally). The Israelites replied: "Entrust thy cause to the true judge [God]." Then Abner released his hold upon Joab and fell dead to the ground (Yalḳ. l.c.). The rabbis agree that Abner deserved this violent death, though opinions differ concerning the exact nature of the sin that entailed so dire a punishment on one who was, on the whole, considered a "righteous man" (Gen. R. lxxxii. 4). Some reproach him that he did not use his influence with Saul to prevent him from murdering the priests of Nob (Yer. Peah, i. 16a; Lev. R. xxvi. 2; Sanh. 20a)—convinced as he was of the innocence of the priests and of the propriety of their conduct toward David, Abner holding that as leader of the army David was privileged to avail himself of the Urim and Thummim (I Sam. xxii. 9-19). Instead of contenting himself with passive resistance to Saul's command to murder the priests (Yalḳ., Sam. 131), Abner ought to have tried to restrain the king. Others maintain that Abner did make such an attempt, but in vain, and that his one sin consisted in that he delayed the beginning of David's reign over Israel by fighting him after Saul's death for two years and a half (Sanh. l.c.). Others, again, while excusing him for this—in view of a tradition founded on Gen. xlix. 27, according to which there were to be two kings of the house of Benjamin—blame Abner for having prevented a reconciliation between Saul and David on the occasion when the latter, in holding up the skirt of Saul's robe (I Sam. xxiv. 11), showed how unfounded was the king's mistrust of him. Saul was inclined to be pacified; but Abner, representing to him that David might have found the piece of the garment anywhere—possibly caught on a thorn—prevented the reconciliation (Yer. Peah, l.c., Lev. R. l.c., and elsewhere). Moreover, it was wrong in Abner to permit Israelitish youths to kill one another for sport (II Sam. ii. 14-16). No reproach, however, attaches to him for the death of Asahel, since Abner killed him in self-defense (Sanh. 49a). It is characteristic of the rabbinical view of the Bible narratives that Abner, the warrior pure and simple, is styled "Lion of the Law" (Yer. Peah, l.c. ), and that even a specimen is given of a halakic discussion between him and Doeg as to whether the law in Deut. xxiii. 3 excluded Ammonite and Moabite women from the Jewish community as well as men. Doeg was of the opinion that David, being descended from the Moabitess Ruth, was not fit to wear the crown, nor even to be considered a true Israelite; while Abner maintained that the law affected only the male line of descent. When Doeg's dialectics proved more than a match for those of Abner, the latter went to the prophet Samuel, who not only supported Abner in his view, but utterly refuted Doeg's assertions (Midr. Sam. xxii. ; Yeb. 76b et seq.). One of the most prominent families (Ẓiẓit ha-Kesat) in Jerusalem in the middle of the first centuryof the common era claimed descent from Abner (Gen. R. xcviii. ).